World War I: How the Great War—and Woodrow Wilson—helped give birth to the movies. How WWI midwifed the movies. 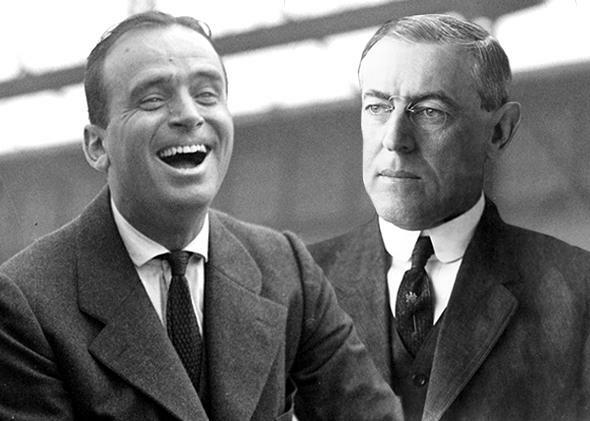 In 1918, Douglas Fairbanks (left), the dashing marquee star of prewar America, sent Woodrow Wilson (right) a “projection machine,” which was often threaded with Westerns. In the opening pages of Wilson, A. Scott Berg’s biography of Woodrow Wilson, we find the 28th president stowed away in a makeshift screening room aboard a ship cruising the Atlantic, catching the latest Chaplin. He’s surrounded by enlisted men still beaming from the armistice of the deadliest war in human history. Throughout the trip from Hoboken to Europe, a celebration of peace that paved the way to the formation of the League of Nations and marked the first time a sitting president had left America’s shores, movie screenings were a daily occurrence. Wilson had always been something of a film buff. “Some days,” Berg writes, “the president watched five hours of moving pictures.” The first-ever screening at the White House was hosted by Wilson, and it sparked a scandal. When defending his blockbuster against claims of racism by the NAACP, D.W. Griffith casually pointed to his screening of The Birth of a Nation for the sitting president as evidence of its widespread acceptance. By Wilson’s second term, private screenings were routine at the White House. In 1918, Douglas Fairbanks, the dashing marquee star of prewar America, sent Wilson the gift of a “projection machine,” which was often threaded with Westerns. The projector became a vital companion, particularly while Wilson recovered from a stroke in 1919, a facet of his remarkable presidency that will perhaps be addressed in the impending Wilson biopic, set to star Leonardo DiCaprio. During the war, Fairbanks promoted the sale of war bonds alongside Mary Pickford and Charlie Chaplin (who, as the Little Tramp, delighted in bonking the Kaiser with a wooden mallet in propaganda films). Wilson’s connection to Fairbanks extended further. Throughout the voyage of peace in 1918, Fairbanks’ resident cameraman, Victor Fleming, shadowed Wilson for weeks as he cavorted with troops, met with the Pope at the Vatican, and glad-handed dignitaries across Europe; the collaboration marked the first time motion pictures entered the official war record. * Years later, that same cameraman would direct two classics that would come to define Hollywood grandeur: The Wizard of Oz and Gone With the Wind. Tucked inside a wave of books released in 2013, in anticipation of the Great War’s centennial, are such crossways, illustrating how the rise of the movie industry coincided with the outbreak of war, and contributed, in some small measure, to the healing process back home. This connection first registered when I encountered Jeremy Paxman’s book Great Britain’s Great War, in which the author devotes considerable attention to the struggles of wounded veterans returning to the workforce. For those whose faces were irreparably disfigured in battle, a favorable option was working as cinema projectionists. Hours were spent in darkness, and the men could arrive early and leave under the cover of night. Paxman documents the advancements in battlefield first aid and wound excision, as well as the creation of copper facemasks to cover facial wounds suffered by soldiers who peeked above the trenches. Television viewers have became acquainted with this tragic facet of the war through Richard Harrow, the copper-masked sniper on the HBO series Boardwalk Empire. When I spoke recently with the show’s creator, Terence Winter, he relayed that it was a co-writer, Howard Korder, who found inspiration for the character after encountering the Smithsonian article “Faces of War.” The piece elegantly chronicles the sculpture studios, including the “Tin Noses Shop” in London, where copper masks were created by a dedicated staff who helped restore a sense of dignity to the postwar lives of the wounded. While matching prewar portraits was the focus, male pin-ups of the day were also used as photographic reference for those lacking confidence in their appearance. Before the First World War, “apprentice adulthood” had been spent under the persistent judgmental gaze of family and neighbors. Now traditional institutions like church, chapel and even music hall gave way to the shadowy, anonymous and erotically charged private contemplations of the cinema. While vets threaded the reels in darkened booths out of sight, the next generation snickered in the seats below. Matinee idols like Rudolf Valentino provided onscreen seduction tips, which boys tested out on Sunday strolls and monkey parades, waltzing past the walking wounded along the way. Many of the men who made the movies of the 1930s, however, were battle-tested. In his riveting 2008 biography, Victor Fleming: An American Movie Master, Michael Sragow charts Fleming’s contributions to the war effort long before he set sail for Europe with Woodrow Wilson. After being drafted in 1917—his first job in the army, Sragow writes, was peeling potatoes—Fleming was recruited by Signal Corps, the bureau responsible for providing a “comprehensive pictorial history of the war.” Of the one or two training and gunnery films he directed a day, Fleming said, “It was my first consideration of the camera as a weapon of warfare and it was highly impressive.” Later that year, he was transferred to the U.S. School of Military Cinematography at Columbia University, where he assessed which cameramen were qualified to document the front overseas. Fleming, who yearned to return to his furloughed career back in Hollywood, was once again surrounded by competent technicians, photographers, and cinephiles. (When the latest Mary Pickford was screening downtown, Fleming ducked out from his duties to see it, and later joined over 100 men in uniform, marching in formation, to attend the latest Al Jolson musical, Sinbad, on Broadway.) Under Fleming’s watch at Columbia was an astonishing array of emerging filmmakers, including Josef von Sternberg, the director who would make Marlene Dietrich an international sensation; Ernest B. Schoedsack, later the co-director of King Kong; and Lewis Milestone a Moldovan émigré who, in 1930, would direct the landmark World War I film, All Quiet on the Western Front. Dietrich, King Kong, and All Quiet make cameos in two books released in 2013 that assess the Nazi influence on Hollywood and exemplify how the anxieties of a world rocked by war had seeped into films of the ’20s and ’30s, tweaking the Germans above all. Ben Urwand’s The Collaboration opens on a Strangelovian bull session in a Nazi screening room, where a panel nitpicks the possible threats of distributing King Kong. One adviser cautioned that the film “provokes our racial instincts to show a blonde woman of the Germanic type in the hand of an ape” and would be damaging to German health. Others feared it might stoke memories of the American and British propaganda campaign during the Great War that portrayed Germans as “savage gorillas who threatened the purity of innocent white women.” The film was ultimately approved under the cumbersome title The Fable of King Kong, an American Trick-and-Sensation Film. An Oscar-winner celebrated for both its grueling and poetic depiction of the Great War, All Quiet on the Western Front faced fierce opposition upon its release in Germany in 1930, documented thoroughly in the prologue to Thomas Doherty’s Hollywood and Hitler: 1933-1939. Resentful of the film’s portrayal of German soldiers as cannon fodder—and startled by the somber reactions the film received at the film’s Berlin premiere at Mozart Hall—Joseph Goebbels launched a violent campaign to disrupt screenings and intimidate potential theatergoers. On the second day of screenings, a cadre of brownshirts released stink bombs, sneezing powder, and white mice in the theater, sending spectators fleeing. Later that night, Goebbels wrote in his diary, “Within ten minutes, the cinema was a madhouse.” Ten years later, the madness had spread far beyond the moviehouse, the sequel more terrifying than any filmmaker could have imagined.